Much Victorian art and architecture was heavily influenced by all things Gothic. This style originated in France during the 12th Century. It continued to develop and change over the next 400 years, until it was superseded by the Classical style. During the 18th century, particularly in Britain, a resistance to the Classical style of the Georgian period developed. Architects, designers and artists looked to Gothic style once again. This early Gothic revival was often fanciful and playful, resulting in an elaborate interpretation of pure Gothic. This period of architecture is known as 'Gothick'. The revival continued in to the 19th century and was embraced wholeheartedly by the Victorians. Architects such as Augustus Welby Pugin were now looking at Gothic architecture far more academically and wanted to create a modern Gothic which followed the original principles. In Guernsey there are a number of examples of Victorian Gothic, such as Victoria Tower and Elizabeth College. Guernsey even has a building designed by Pugin himself, the church of St Joseph and St Mary in St Peter Port. 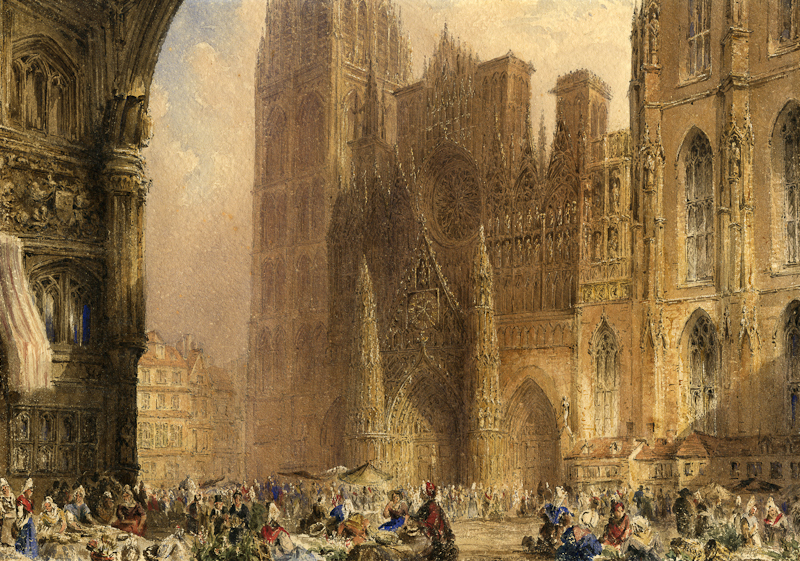 In this wonderfully detailed watercolour by Peter Le Lievre depicting Rouen Cathedral, we can clearly see his interest in the architecture, illustrating its visual impact perfectly. The intention of much original Gothic architecture was to create a structure which would shimmer and reach up to the heavens, using a mixture of glass and stone. It was purely a religious statement, unlike Victorian Gothic, which could be both religious and secular. Le Lievre has captured this otherworldliness that many of these buildings possess. He has also emphasised the sheer height of the cathedral by showing it towering over the crowds below, conveying the power of God and the Church relative to Man.